Prairiebreak: Rosulate, Roseate but not a rose! Rosulate, Roseate but not a rose! There is something about rosettes: the sympathetic symmetry (surely not all have fibonacci sequencing? ), the rotundity...something there is that likes rosularity. Nature certainly seems to--at least in some of her more challenging ecological environments. This first picture was taken two years ago this March in the southern Sierra Nevada foothills, near our friends' Susan Eubank and Paul Martin's wonderful mountain homes. 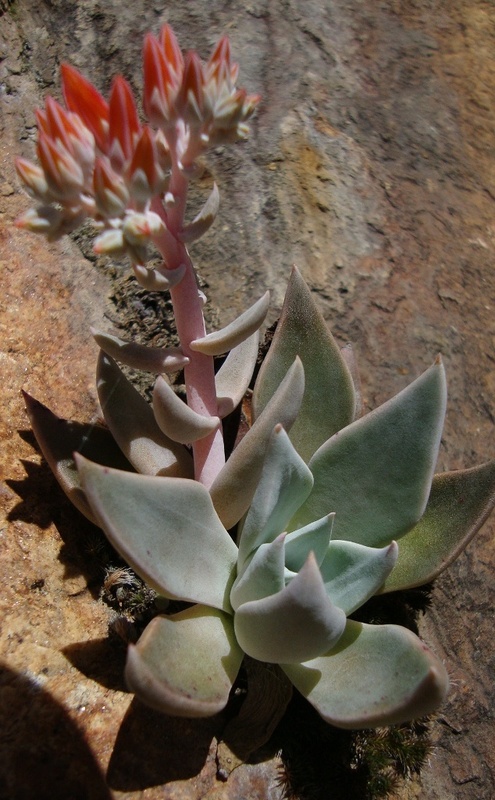 I collected seed of this plant in the Yuba River canyon with my buddy Ted Kipping twenty years ago on my first field trip with Sean Hogan (I knew there had to be winter hardy forms of Dudleya). Since that time I have grown dudleyas in three gardens for years....but now I suddenly am bereft! Encore cherchez la rose! Physaria alpina on Horseshoe Mt. This lovely boutonniere grows only on two mountain ranges in Central Colorado. It was only described to science in the early 1980's, how strange that I and so many others walked by such a distinctive and showy plant and never realized it was new! Surely, the most rosulate of crucifers, it too is a wonderful garden plant...although I realize that it too has slipped through my fingers...Time once again to find that rose! Surely, no plants were better named than this genus of Crassula cousins from the Mediterranean and continental Asia. I purchased a plant with this name decades ago that turned out to be Rosularia rechingeri from Turkey. I believe Mike Bone and I from Denver Botanic Gardens are the first to collect and introduce seed of this to cultivation. This is one rose that has not slipped away as yet! Claytonia megarhiza on Horseshoe Mt. The bigroot spring beauty (Claytonia megarhiza) is one of our most abundant rosulate native plants at high elevations, seemingly growing bigger and more robust as the altitude climbs. My friend, Loraine Yeatts, once pointed out the strange anomaly that dryland plants from the subtropics and tropics like Echeverias, bromeliads and agaves have evolved the same succulent rosulate form as montane and high alpine plants such as those I'm featuring here. Notice that the Claytonia is actually growing in running water (something anomalous for it to be sure)...how can the same morphological adaptations: rosulate form and succulence, work both for desert xerophytes and high alpines growing in running water? The mystery of rosularity!